He attended Cwrtsart Secondary School where he played for the school team and this earned him a place in the Neath Schools squad and later the Welsh Schoolboys. It seemed like he was set to follow Brian Flynn to Turf Moor but he was rejected after trials and it was Jack Packard who persuaded him to come to Elland Road for a trial. It was not successful as he became homesick and returned home after a few days and started work in a factory, but still played Junior football. Leeds then sent John Charles down to Wales and he persuaded him to return to Elland Road as an apprentice and he eventually signed professional, in November 1973, when he was seventeen, and Leeds were rewarded as they were able to mould the speedster into an International player. He was nurtured by Jimmy Armfield and made his first-team debut as a seventieth minute substitute, for Peter Lorimer, in a UEFA Cup tie at home to Ujpest Dozsa on 6th November 1974, just after his eighteenth birthday. 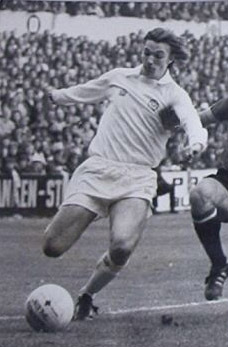 He followed this with his League debut, again as a substitute, this time for Johnny Giles, who was making his final League appearance for Leeds, on 19th April 1975 and it was Harris that scored the winning goal in a 2-1 home win over Ipswich Town. He became the regular Leeds substitute, even though he was first capped by Wales in the Football Association of Wales one hundredth Anniversary Match against England on 24th March 1976 at Wrexham. This was after his Under-Twenty-One cap as he came on as a seventy-third minute substitute for Robbie James in a 2-3 defeat by Scotland on 9th February 1977, in a game that saw his Leeds teammate David McNiven also come on as a substitute at the start of the second half in place of Paul Sturrock, but with minutes remaining it was he that got the winner, at Easter Road. He also had an Under-Twenty-three Cap, which he gained on 4th February 1976 in a 2-3 defeat by Scotland at Wrexham, and his Welsh Youth honours. In 1980-81 he was United’s top scorer and an established international accumulating twenty-four caps, in his time with the club. They included six in which he came on as a substitute and six in which he was substituted. He scored his only goal on 25th March 1981, in the sixty-seventh minute when he scored the only goal of the game as Wales beat Turkey 1-0 in Ankara in a World Cup Qualifier. However, after Leeds were relegated he was transferred to Charlton Athletic for £100,000 in July 1982. At Leeds, Harris never really fulfilled his true potential, but was excellent value. Growing up with, and looking up to, the greats that Leeds had in his formative years at Elland Road, he became disenchanted with the club’s decline and revolving door management style. He saw out his contract and left of his own free-will. He maintained his form at the Valley but was unable to add more caps. He made seventy-three starts and three substitute appearances in the League, and scored eight goals, whilst with the Addicks. However, after struggling with injuries, he returned to Leeds, but, after an unsuccessful trial in the Central League, he eventually joined Bury in December 1985, scoring four times in thirty-three starts and five games from the bench at Gigg Lane. In July 1986 he had trials with Swansea and Cardiff, then, after further trials at Airdrie, where he played just one game, he joined Rochdale in January 1988, scoring three times in twenty-four starts and one game off the bench, and Exeter City in December 1988. He scored once in eleven starts and five substitute appearances and in summer 1989 he was given a free transfer by Exeter and temporarily ended his football career. He joined his father-in-law’s removal business and remained there until he took over the business, on his father-in-law's retirement. At the start of the 1992-93 season he was appointed player-manager at Abucus Welsh League club Briton Ferry Athletic, later becoming the club's general manager. He was at Briton Ferry for two seasons making sixty-eight starts and one substitute appearance and scoring seven goals. After that he played in the Welsh League with an assortment of clubs. In 1994-95 season he scored once in fourteen games for Afan Lido, failed to score in ten games with Maesteg Park Athletic and scored once in ten games for Ton Pentre. 1995-96 saw him back for the whole season at Afan Lido where he scored once and made thirty-nine starts and another from the bench. 1996-97 saw him at Carmarthen Town where he scored once in twenty-six appearances, before rounding off the season and his career back at Ton Pentre starting twice, and one off the bench, without scoring. He now runs the Haulage business which has changed its name to Carl Harris Removals & Storage.